Open all year from 10.00am daily the Pavilion Bar has some of the best views in Norfolk so don’t just visit when you come to the theatre! On offer is a full range of drinks including draught beer and quality wines. We also have a selection of continental coffees and teas as well as hot snacks and cakes. Stunning views and a unique location make the Pavilion bar the perfect place to take a relaxing break. Meet with friends, sit back, and watch one of those magnificent sunsets that everyone talks about and on one of those ‘wild weather’ days, watch from your unique vantage point as the waves roll in towards the shore and sip a steaming cup of hot chocolate. 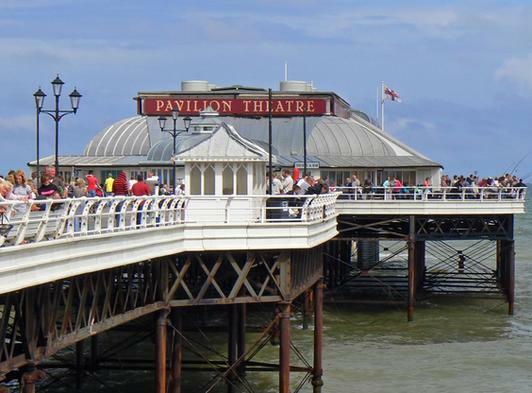 The Pier is a splendid Grade II listed Victorian Pier, awarded Pier of The Year by The National Pier Society and enjoyed by generations of visitors. Originally opened for entertainment in the 1890’s as an open air bandstand the theatre was enclosed in 1905 forming the beginnings of the theatre we know today. The Pier has become a prime filming location, recently featuring in The Barbara Windsor drama filmed by the BBC. Whatever the reason you have for visiting Cromer Pier, our friendly staff are here to help make your visit complete.